The future of furniture is here. Few household staples have proven to be as reliable as the chair. Formerly restricted to purely functional forms, now, more than ever, artists, designers, and furniture purveyors are pushing the conventional boundaries of the home essential. This year, a small batch of visionaries took their inspired reinventions to High Point, North Carolina for an inaugural exhibition dedicated to otherworldly seats. Aptly-titled “This Is Not A Chair,” the show—which debuted on October 12 at Plant Seven, a new creative space and cultural center in High Point—brought together a curated selection of works from 40 artists and designers around the world who are blurring the boundaries between form and functionality. Though, this isn’t the first time we’ve seen chairs reinterpreted as sculptural objects. Statement seats were also a standout trend at Milan Design Week earlier this year—commencing a new wave of unconventional ways to think about momentary rest. From traditional wing backs to two-seater benches, the objects featured in “This Is Not a Chair” question the intrinsic qualities of traditional seats and take what, by most standards, has long been considered a household staple, and transform it into a conceptual statement. Chunky, brutalist stools, contoured loungers, and stringy rockers were just a few highlights from the show. Read on for our favorite reinventions for the exhibit, and what they mean for the future of the chair. Nostalgically reminiscent of childhood building blocks, this lego-like seat by Andrew Miller and David Ruperti, the duo behind the collaborative Brooklyn-based architecture and design studio, Andy and Dave, channels the fun of a real-life Tetris game. Based solely on the intersection of vertical and horizontal planes, their towering lavender structure is a cushy, climbable visual treat. Fusing the comfort of a hammock with the streamlined beauty of a classic lounge chair, Asa Pingree’s slinky, singular creation is a direct reflection of the designer’s penchant for clean lines and lightweight structures. The swooping silhouette is as much about minimal living as it is about movement. While a number of the chairs in the exhibition clearly aren’t made for sitting, this spectacular exception is a welcomed invitation. The small space movement has been a primary source of inspiration for furniture designer Gabriel Tan as of late, and it shows in his latest creations. Largely influenced by shaker designs, Tan’s three-legged Stove Chair boasts the simplicity of the post-war movement, but with a tiny twist. In addition to its short backrest and compact seat shape, the chair’s storage capabilities make it a prime choice for a teeny apartment. Much like a coat or a hat, the Stove Chair can be hung on the wall, only coming into play when absolutely necessary. Tom Shields has seamlessly mastered the art of layering. Working almost exclusively with chairs, the Ashville-based artist’s intertwined iteration of an ordinary ladder back at High Point did not disappoint. At first glance, his three-chair mashup is a bit of a mystery (though, this seems to be the point). Puzzled together to create a harmonious amalgamation, after a while, you begin to believe that this is the only natural way to recline. Comprised of natural rubber and a Corian base, Brooklyn-based design duo, Kristen Wentrcek and Andrew Zebulon’s odd and tactile riff on the two-seater bench is an intriguing experiment in weight and materiality. Working in contrast with the lightness of the base of the bench, the jaunting thickness of the buoyant cushions, which appear to have been haphazardly stripped from a larger sheet of rubber and displayed as is, create a compelling scene. This rockhard chair is about as sturdy as they come. Designed as a part of a series that explores furniture made for architectural models, MOS Architects’ metallic stool is intended as a close-up representation of generic and mundane forms that have long inspired the furniture making process. While this isn’t the first spot we would seek comfort, we can appreciate the sense of safety its sheer rigidity provides. 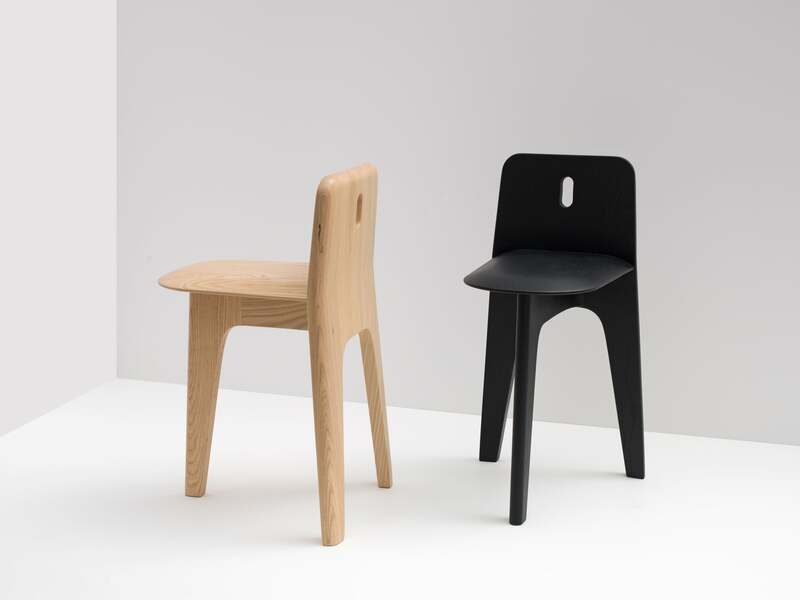 With a nod to Nordic design, the all-encompassing nature of MSDS’ extra wide chair instantly captured our attention. Based on an ancestor of the Windsor chair from the 1600s, the Toronto-based firm’s version flawlessly balances old-world charm with contemporary design. Spare in its use of parts and points of connections, the minimalist-approved seat is succinct, without compromising its structural roots. Primitive, bulbous, and straight to the point, Loïc Bard’s jet black statement stool is the perfect blend of futurism and Brutalism. Its basic, stout body gives the piece a Stone Age edge, while its cylindrical legs and eery exterior impart the piece with a modern energy.